When bananas get past the point of good eating, I throw them in the freezer. Bananas are about the only ingredient that can happily be cooked with when past it’s best – so a freezer full of overripe ‘nanas simply means supplies are at hand when the urge to make banana bread – or muffins, in this case – strikes. A quick zap in the microwave, and they are ready to go. 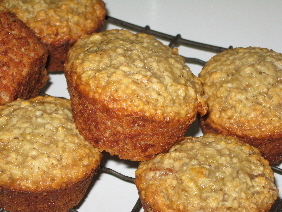 The youngest MakeBaker had made some very nice apple muffins a ways back, and a few weeks later I asked for the recipe. She couldn’t quite remember the details, but gave me a what she thought she’d done (the Makebakers aren’t known for sticking to recipes! ); I then discovered I didn’t have all the ingredients. So this is inspired by hers, built according to my pantry, and the result is totally different. The oats and banana make for a moist muffin, a little dense, but rather fine with cream cheese and a dusting of icing sugar. Preheat oven to 180C. Combine first seven ingredients in a large bowl. Add the pear and shredded coconut and stir to combine. Melt the Nuttlex, add the egg and coconut milk, then beat in the mashed banana. Add the liquid to the dry ingredients. Spoon into muffin tray. Bake for 15-18 minutes or until a toothpick insert in the centre comes out clean. Cool in tin for 5 minutes before removing to a wire rack. Ice with cream cheese frosting, or serve with butter.